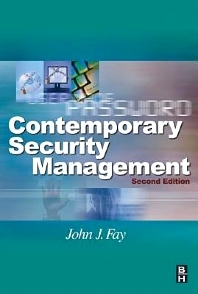 Contemporary Security Management, Second Edition, is the most comprehensive and up-to-date security management book available. The book is designed to provide the hard facts on modern practices to efficiently and effectively run a security department. It covers such vital topics as leadership in management, employee relations, risk management and mitigation, terrorism, information security, access control, investigations, substance abuse, workplace violence, and emergency management. New topics covered include terrorism and the post 9/11 government mandate to perform standard vulnerability assessments for various industries. All the chapters have been updated and include the latest trends, technologies, and best practice procedures. Case studies throughout the text provide real-world examples and solutions to management issues. Samples of security plans and procedures, checklists, diagrams and illustrations aid in explaining a wide range of critical concepts. The book serves as an indispensable working tool for students in security management courses, security managers, and other security professionals at all levels of experience. Mr. Fay was a special agent of the U.S. Army Criminal Investigation Division (CID) and later the Director of the National Crime Prevention Institute at the University of Louisville. He has held security management positions in the petroleum industry while teaching at the university level. He holds the Master of Business Administration degree from the University of Hawaii, and is a well-known and respected author of many books, including Butterworth's Security Dictionary: Terms and Concepts, Drug Testing, Encyclopedia of Security Management: Techniques and Technology, and Model Security Policies, Plans, and Procedures, all by Butterworth-Heinemann.Was a special agent of the U.S. Army Criminal Investigation Division (CID) and later the Director of the National Crime Prevention Institute. Former manager of security for British Petroleum's operations in the Gulf of Mexico. He was previously an adjunct professor at the University of North Florida and the University of Houston.